The 10th Anniversary of the Ride of Silence is tonight, Wednesday May 15, 2013. The Ride of Silence honors those that have been injured or killed in a bicycle collision or crash. This year's Chicago ride is particularly poignant as just last night an 83-year old bicyclist was killed in a collision with a motor vehicle on Irving Park Road on the Northwest Side. This morning a bicyclist in her 30's was killed just outside of the Busse Woods Bicycle Trail in Schaumburg. The Chicago Ride of Silence will leave from Daley Plaza at approximately 6:45 p.m. 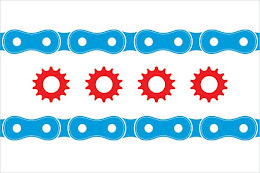 There are also rides at 17 total locations throughout Chicagoland and Illinois including Arlington Heights, Bartlett, Batavia, Downers Grove, Elmhurst, Evanston, Geneva, Joliet, McHenry, O'Fallon, Oak Lawn, Oak Park, Peoria, Rockford, Urbana and Winfield. Please go to the Chicago Ride of Silence website for more information. A special thanks to Elizabeth Adamczyk of Ride of Silence - Chicago for her tireless efforts in promoting the Ride of Silence and making bicycling safer.